As a crew chief, Richard Boswell understands his racecars inside and out. And as a former driver, Boswell also understands and appreciates what his wheelmen need from their racecars and their team. This balanced background allows Boswell to excel in his role as crew chief for Chase Briscoe and the No. 98 Nutri Chomps team of Stewart-Haas Racing with Fred Biagi (SHR) in the NASCAR Xfinity Series. Like many in motorsports, Boswell’s earliest memories in life center on racing. His family owns a picture of a 3-year-old Boswell fetching tools for his father, Dickie Boswell, who successfully campaigned a Late Model stock car out of their hometown of Friendship, Maryland. The elder Boswell ultimately competed in 57 Xfinity Series races spread over six seasons in the 1980s. Although he never made it to the elite NASCAR Cup Series, the senior Boswell totaled four top-five finishes in the stepping-stone division to Cup. His son followed in his footsteps, climbing behind the wheel and winning multiple World Karting Association national titles in 1998. The younger Boswell recalls racing karts at Daytona (Fla.) International Speedway where the driver to beat was Rodney Childers – the same Childers who serves at Kevin Harvick’s crew chief at SHR in the NASCAR Cup Series and is a valued resource to Boswell. After graduating to Late Model racing in 2001 and enjoying success, it was none other than Dale Earnhardt Jr. who noticed Boswell’s talent and brought him to his JR Motorsports team in 2006, whereupon the youngster pursued his racing dream by piloting the team’s entry in the Hooters Pro Cup Series. Boswell made 19 starts, posting three top-five finishes while also working on JR Motorsports’ Xfinity Series program. Earnhardt even financed Boswell’s lone Xfinity Series start in 2009 at Memphis (Tenn.) Motorsports Park where Boswell qualified third and finished 23rd. Despite Earnhardt’s best efforts, sponsorship could not be completed for Boswell to run any more races. But as one chapter closed on Boswell’s racing career, another opened. Boswell decided to hang up his helmet and work on his new goal of becoming a top crew chief in NASCAR. Always prepared and constantly planning for his next step, Boswell simultaneously earned a mechanical engineering degree from the University of North Carolina at Charlotte while pursuing his driving dream. Boswell honed his craft at JR Motorsports and even advanced to Cup in 2014 where he worked on Hendrick Motorsports’ No. 48 team with driver Jimmie Johnson before returning to JR Motorsports in 2015. Two years later, SHR formed its own Xfinity Series team and Boswell was chosen to lead the team’s part-time effort, which complemented the full-time program being run for then rookie Cole Custer. With Harvick at the wheel, Boswell claimed five top-five finishes in six starts. 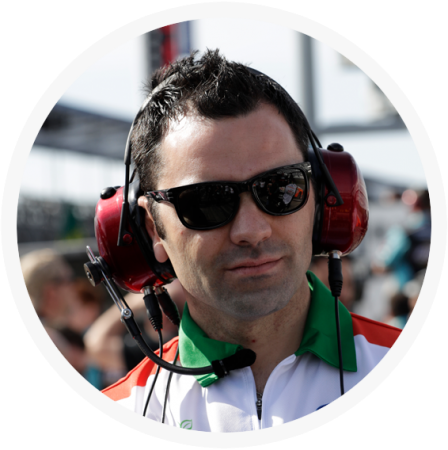 Another part-time schedule was run in 2018, where Boswell worked with veterans Harvick and Aric Almirola in addition to the up-and-coming Briscoe. Harvick scored the No. 98 team’s first win at Atlanta Motor Speedway in March while Briscoe nabbed his first career Xfinity Series victory at the Charlotte (N.C.) Motor Speedway Roval in October. After back-to-back part-time schedules with multiple drivers, Boswell enjoys consistency in 2019 with Briscoe being the full-time driver for the No. 98 team, with the duo campaigning the entire 33-race Xfinity Series schedule. Boswell resides in Mooresville, North Carolina, with his wife Ashley and their three daughters, Elizabeth, Grace and Juliette.